Good openings to speeches count for a lot. They don’t guarantee a good result for your speech. However, a good start is a near certainty for public speaking success. So, knowing how to open your speech with style counts for a lot. Starting your speech comes down to your choice and style. Choose something with which you are comfortable. 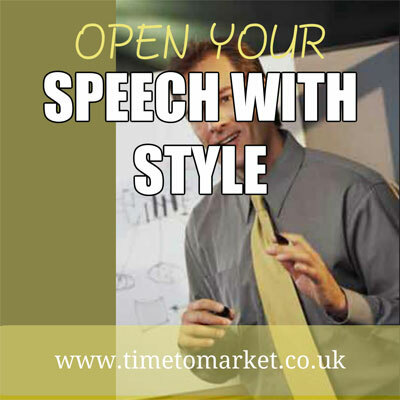 And to make it even simpler there are at least five ways to open your speech with style. Novelty. An innovative way to open your speech with style might take advantage of external props, lighting or sound effects. It could involve you speaking from somewhere other than the podium – perhaps from the middle of the audience seating area. It works because the novelty builds interest and appreciation right from the start. Drama. A dramatic start to your speech with some style could involve a serious tone of voice, an exclamation or a shout. It might entail a news item or some note of heightened urgency. So, consider a dramatic and novelty opening when you begin your presentation. Of course, you can always use music as an opening. Certainly that’s what they used for this Jeremy Corbyn speech in Liverpool. Ask a question. When you raise a rhetorical question during your opening you don’t expect it to be answered by your audience. Instead you use the question to set the framework for your speech. So you pose an answer and then build the interest. That was always a favourite with an Ed Miliband speech. Humour. A humorous style start to your speech should succeed in setting the tone for the rest of your speech. But note that good humour has to be planned and timed to perfection. You can see how President Obama handled this with his Alfred Smith Memorial Dinner speech. So, you should aim to practise and test this way of opening your speech. Note also that any humour should be safe for your particular audience. Reference. Referring to other events, people, places and pastimes can be an effective and stylish way to open your speech. That’s because references set out parallel paths, connections and links that deserve further exploration. The most popular of all speech beginnings, the reference is a simple and effective start. And, of course, you can always tie this in with a quotation for even more impact. That’s what you hear with this Michael Gove speech. As a public speaker you should know how to begin your speech. So, here are 5 top tips to help you begin your speech. Do something novel or innovative. Have a dramatic beginning with noise, music or lighting effects. Ask a question…and then set out to answer it. Use humour, but don’t tell a joke. Make a reference to something, someone or an event. How you actually start your presentation is a matter of personal choice and style. There are several options always available to you. But your choice has purpose. Because your opening aims to lay out the common ground with your audience. It sets the tone for everything that follows. It builds interest. Therefore it affirms why you are qualified to speak on the subject. You can find out more ways to open your speech with style and other public speaking techniques when you join a public speaking training course at one of more than 40 UK training venues. So, when the time is right, please don’t hesitate to get in touch.